NEW ORLEANS, June 10, 2016 – Today at the 76th Scientific Sessions of the American Diabetes Association, Nutrino, Inc. announced a partnership with Medtronic plc that will give people with diabetes an individualized picture of how daily food intake and other measures impact glucose levels. People who use Medtronic continuous glucose monitors (CGM) and insulin pumps in the United States will be able to connect them via MiniMed® Connect and CareLink® with the Nutrino app, a 24/7 nutrition companion, to get food suggestions and meal plans tailored to their carbohydrate intake, glucose levels and other measures. "By working with Nutrino, we can have a real impact on the food decisions people with diabetes face every single day," said Annette Brüls, president of Global Diabetes Service and Solutions, Medtronic Diabetes. "With this new service, we will not only enhance our customers' day-to-day lives but will also help us collect insights to inform how we approach diabetes management in the future as we work to transform care to drive greater freedom and better health. In addition, the Nutrino diabetes-specific, validated food database and carb counting support will be available in Medtronic's digital offerings." People living with Type 1 and Type 2 diabetes must manage their daily carbohydrate intake to keep glucose levels in check. Now, they will be able to download the Nutrino app and connect it with their CGM and insulin pump to get a picture of their FoodPrint™ – proprietary technology that shows how their daily food intake, activity, sleep and other parameters affect their glucose levels. In addition, the Nutrino app also connects with and draws data from multiple wellness devices and activity trackers such as Apple HealthKit, Runkeeper, Moves, Jawbone, Withings and Fitbit. Easily Count Carbs: Advanced carb counter based on search, text and image tracking will support a highly manual activity performed before every meal. Get Personalized Restaurant Menus: When eating out, get specific suggestions on menu items in over 200,000 restaurants in the U.S. based on meal history, location, food preferences, dietary restrictions and allergies. Access Nutrition Suggestions: Information available based on current American Diabetes Association guidelines and up-to-date scientific research. View Eat-at-Home Meal Suggestions: Tailored meal plans, recipes and food suggestions based on personal information and health indicators streaming between the app and CGM/pump via MiniMed Connect and CareLink. Have a Grocery Shopping Companion: Barcode scanner that helps determine carb count and other information on food items at the point of purchase. Get Personalized Carb Analysis Reports: Analysis of how carbohydrate intake, insulin use, exercise, water intake, stress and amount of sleep impact glucose. "We are excited to partner with Medtronic to bring advanced nutrition insights to people living with diabetes," said Yael Glassman, president, Nutrino. 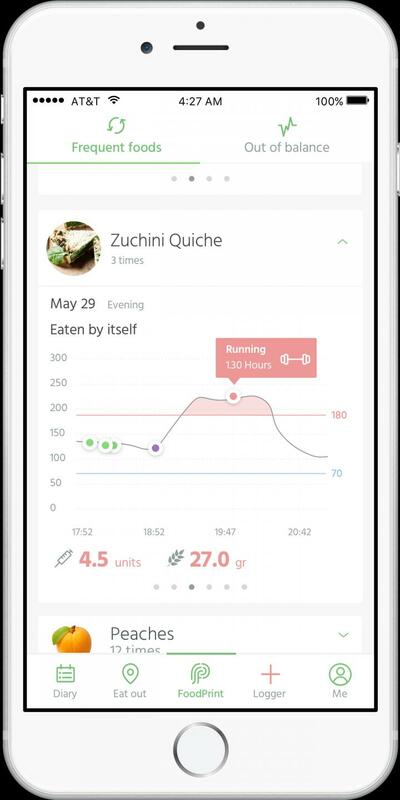 "This is an important milestone for Nutrino as we take personalized, contextual and digital nutrition to the next level for the benefit of people living with chronic conditions." According to the American Diabetes Association, more than 29 million Americans (9.3 percent of the population) are living with both type 1 and type 2 diabetes. Each year, 1.4 million Americans are newly diagnosed with diabetes and the disease remains the seventh-leading cause of death in the United States. The beta App is available in the U.S., free of charge, for a limited time. People who use MiniMed Connect or have their CGM data in Apple HealthKit can benefit from the special diabetes features in Nutrino. To download the Nutrino beta app for diabetes, please visit https://medtronic.nutrino.co. Nutrino is intended to help you understand your individual response to certain foods so that you can maintain a healthy diet. It should not be used as a basis for insulin dosing decisions or for trending and tracking of continuous glucose monitoring device (CGM) data. It does not provide current, real-time glucose information. For specific review of CGM data, only the CGM device itself or the CGM manufacturer's supporting software should be used. We're all different. But until now, the field of nutrition didn't acknowledge that simple fact. Why "until now"? Because now there's Nutrino. Nutrino scientifically determines the best foods for you as an individual. It takes into account your lifestyle, your health goals, your food preferences and eating habits, everything that makes you, you. It pulls in data collected by wearables and select medical devices to get to know you even better. Then it takes all this information to devise the best food choices for you. Nutrino even helps you make whatever changes you have to make to put these suggestions into effect. For more, visit http://www.nutrino.co. MiniMed® and CareLink® are registered trademarks of Medtronic plc.